I used this image recently, but I love her so much I just had to use her again. Isn't she just perfect for a "Back To School" card? I decided to colour her up using pencils this time. I used a 6"x6" white base for this card. The papers are from Lidl & the twine is from American Crafts. The little buttons are die cut using Tattered Lace dies. to give the card a little dimension! Fabulous card and loving the image she sure does look happy and a great sentiment. Have a wonderful day Dawn. What a super cute card!! Love the adorable little girl image and great take on the sketch!!! Thanks for joining us at Cut it Up challenge! Hi Dawn, love this little cheerleader, she's fab. The papers are amazing, definitely need a trip to Lidl later. I like how you separated the words Too Cool For School. It's like a cheer! Thanks for joining us for our Sports challenge at Cut it Up! This is perfect for our current challenge “BACK TO SCHOOL” at Pattie’s Creations. What a cute image too! Thanks for joining us! A fabulous card Dawn, such a fun image and pretty pastel colours. Great card Dawn. Super image and design. Fun design, Dawn. Love the cloudy bg panels and the cheerleader is colored beautifully! Hi Dawn, what a beautiful card! That is such a fun image! This is such a fun card and lovely papers and embellishments. Adorable and great colors and coloring! I almost wish I was going back to school, almost! That is an adorable back to school image! Great job with the colored pencils! Thanks for joining us at SSW2! Love your sentiment! Thanks for sharing your lovely card with us at Creative Corner. Such a cute card Dawn, love this sweet image and your wonderful colours and great embellishments. 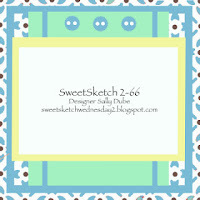 Great card and thanks so much for sharing your card with us over at Sweet Sketch Wednesday 2 and good luck. This card is SUPER cute (insert pom-poms waving here). I really DO like it. Your cloud background paper is perfect and that image is fab (I may NEED it!). Thanks for sharing this with us. Cute card. Thanks for joining us at Cut It Up. Thanks so much for entering our very first challenge at the Pencil Case! Hope to see you again next time! Totally cite card. Love that image and the gorgeous colour scene you have used. Love this Dawn! What a beautiful and cute design. Great details, digi and colors. Thanks for your entry in our challenge at Tuesday Throwdown! What a beautiful and cute design. Great details, digi colors. Thanks for your entry in our challenge at Frosted Designs! this is absolutely adorable!! Thanks for sharing with us at Frosted Designs!! Wow! Wonderful card with so funny image! And card itself is so bright! Thank you very much for plyaing with us at Fussy and Fancy Friday Challenge. Good luck and hope to see you again soon! Wow! Wonderful card with so fuuny image! And card itself is so bright! Thank you very much for playing with us at Fussy nad Fancy Friday Challenge. Good luck and hope to see you again soon! Cute card. Thanks for sharing at frosted Designs. Thanks for playing in our "BACK to SCHOOL" Challenge #114! Very Cool Dawn. Love that funky cloud paper and those cute heart buttons. Thanks so much for entering your card into our latest challenge over at Pattie's Creations. Good luck in the draw. Adorable!!!!!! Thanks for playing along with Frosted Designs!!!! !